“Nucleaire Romantiques” (1979-present) was one of the hottest bands to blow down from the frozen North of Michigan in the late 70s-early 80’s. Fronted by the blistering licks and staggering beauty of Eleanor (no last name given) on lead guitar, the Romantiques were anchored by the thundering rhythm section of Toivo Mackelakangishelmuumaki (if I’m spelling that correctly) on drums and Nelson Marlowe on bass. Lyssa Strada rounded out the core line-up, laying down the tasteful and playful keyboards. Special mention has to go to Larry Pye, their sound man and occasional percussionist. Happy Monday! I thought we were way overdue for some silly fun. Coming up, Larry and Stephanie discuss some important, and not so important stuff. Since Stephanie’s involved, I think I can guarantee some smiles. Stephanie has a navel. Okay, but while I was admiring her belt buckle, I wondered if she shaves . . .
She has a beautiful body, Charlie. Thanks. One more thing. You do sweet feet. It’s the mark of a true artist. No, Stephanie doesn’t have hair, exactly. That’s why it doesn’t move when she’s in the car. 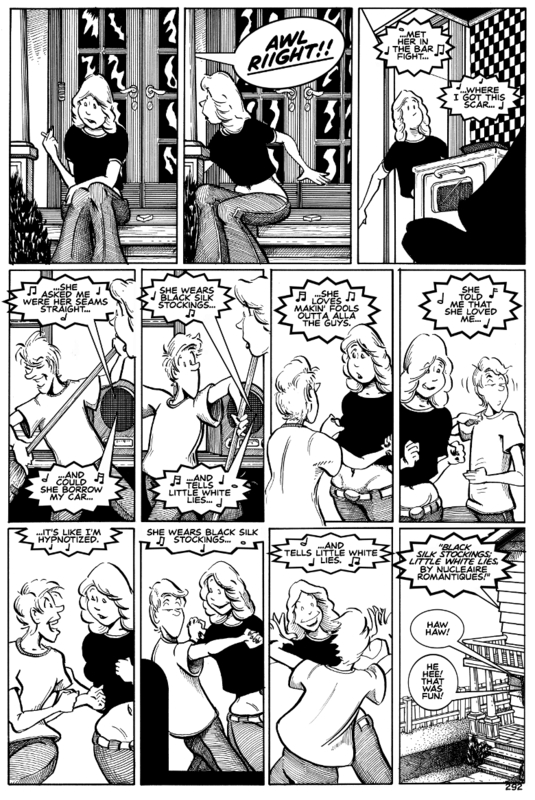 In fact, I had to think about whether to show her hair swaying in the 10th panel when she’s dancing. Stephanie is-how shall I put this-“anatomically correct.” Though she wasn’t completely when she originally arrived. Eleanor had something to do about that. And thank you for that compliment about feet. They’re darn difficult for me to draw.